My 12 leftover Prussian Hussars presented a little more of a challenge than the 12 Austrian Hussars from last month. 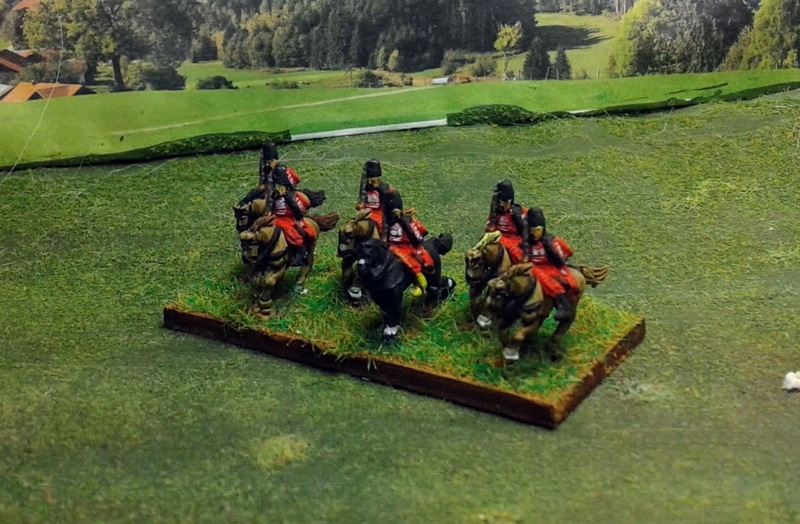 Old Glory actually does two different sculpts for the Prussian line with a Mirlton or Busby as headgear options. Rather than mix one unit (or buy more figures ) I decided to do two 'half-regiments" I can combine depending on the scenario. 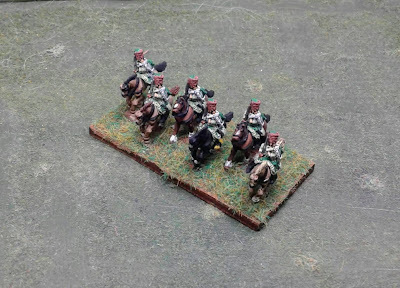 Thus, the six remaining Busby miniatures entered the Szekely Hussars with a distinctive mix of greens (they were also at Chotusitz which is the first scenario I want to run). The six figures with Mirleton were painted to represent the Seydlitz Hussars, because as long as you have painted the Black Hussars and the White Hussars you should probably just add the "Red Hussars" to complete the set. This has at last exhausted my supply of light cavalry on-hand. There are still a few regiments of Dragoons on tap and of course Curassiers. 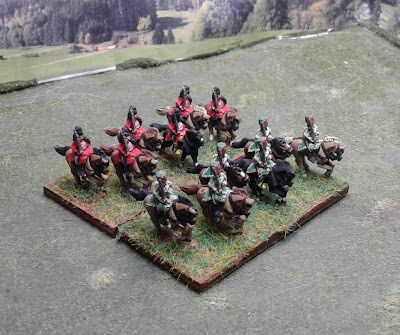 I just managed to paint up the last two Prussian Infantry regiments so at least that part is almost done (following the basing and standards of course.) So what is still waiting for completion? Maybe I can get to half of them by March? Perfect path to follow by building two half-regiments surplus figures. Your hussars are terrific. Have you fought any more battles with these troops? No more battles yet. We did a couple tabletop teasers, but Runewars and C&C are more Mason's style right now. Great looking Hussars; I especially like the Szekely in the Green!